This interesting surname is of Anglo-Saxon origin, and is a locational name from any of the various places so called. The majority, with examples in at least fourteen counties are named from the Olde English pre 7th Century "hoh" meaning ridge, spur with "tun", enclosure, settlement, hence "settlement on the spur of a hill". 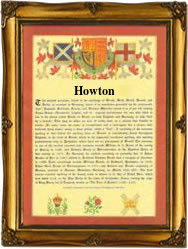 Haughton in Nottinghamshire also has this origin. A small group of Houghtons in Lancashire and West Yorkshire have as their first element the Olde English "halh" meaning nook, recess. In the case of isolated examples in Devon and East Yorkshire the first elements appear to be the Olde English pre 7th Century personal names or bynames "Huhha" and "Hofa". Early examples of the surname include: John de Haleghton (Yorkshire, 1273), and Alexander de Houhton (Cambridgeshire, 1273). A notable bearer of the name was Sir Robert Houghton (1548 - 1624), governor of Lincoln's Inn, 1588 - 1603; serjeant-at-law, 1603, and judge of the king's bench, 1613 - 1624. Chris Houghton, aged 19 yrs., who embarked from London on the ship "Thomas and John" bound for Virginia in July 1635, was one of the earliest recorded namebearers to settle in America. A Coat of Arms granted to the Houghton family is a black shield with three silver bars and a gold rose in chief, the Crest being a silver bull's head, attired gold, gorged with three black bars, on the centre one a rose of the second. The first recorded spelling of the family name is shown to be that of William de Hoctona, which was dated 1115, in the "Winton Book of Hampshire", during the reign of King Henry 1, known as "The Lion of Justice", 1100 - 1135. Surnames became necessary when governments introduced personal taxation. In England this was known as Poll Tax. Throughout the centuries, surnames in every country have continued to "develop" often leading to astonishing variants of the original spelling.